Hello, Friends! 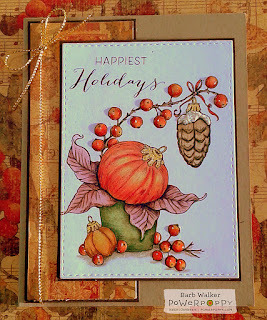 November is in full swing and I can I feel a little twinge of Holiday Cheer in the air. I love this time of year, especially the colors, and the fragrances, the music and the overall warmth of the season. I like to just stop, look and listen and take it all in because it will all be over before we know it. 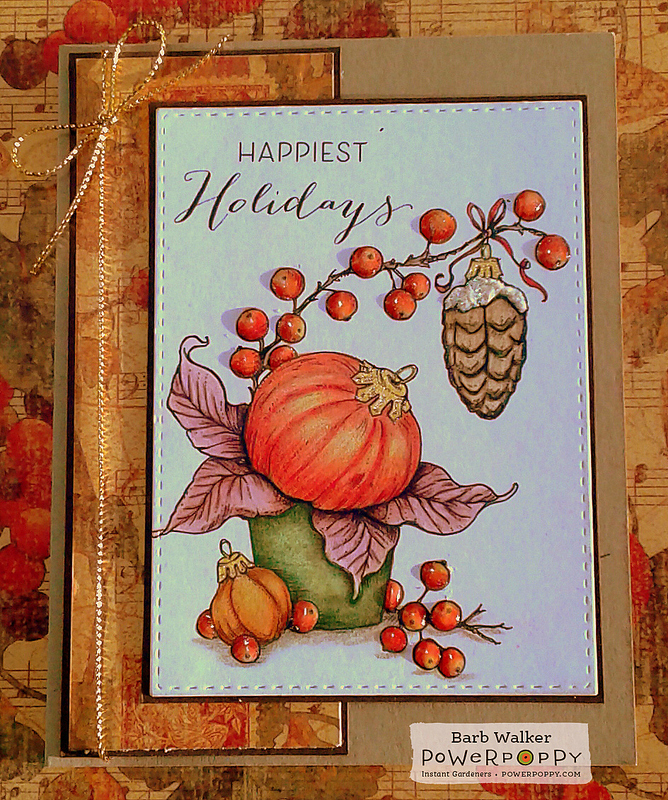 For my card share today, I am revisiting Power Poppy's Forest Finds digi set. I finished coloring it and got it onto a card. It's a reflection of my feeling about the season. I adore this image. It's such a perfect combination of Autumn and Christmas. I've been contemplating enlarging this image, coloring it, framing it then using it as wall decor. I love it that much! Anywho...here are a few details about what I did here. I printed the image onto Papertrey Ink's Rustic White card stock and I die cut it with a Simon Says Stamp Stitched Rectangle die. I colored the image with Prismacolor colored pencils and used a Prismacolor blending pencil to smooth out some of the pencil strokes. I added a coat of clear Wink of Stella on the berries and then covered that with Crystal Effects. I used a gold glittery gel pen for the ornament tops. For the top of the pinecone, I used Liquid Applique, unheated and I sprinkled glitter on top and let it air dry. I meant to put a little bit of gold Perfect Pearls on the pomegranate but I forgot until after the photo was taken. And finally, I decided to flush mount the focal panel, after MUCH deliberation. So, that's it for me today. There are new Power Poppy digi sets in the making and I will be back in a few days to share them with you. Can you believe that THANKSGIVING is just NINE days away?! It really does seem like November just began. Where oh where does the time go? Enjoy the remainder of your week, my friends! Thank you for stopping by! Barb - it would be a beautiful wall decor! You have created a gorgeous card, a true cross-over! Oh Barb, this is glorious! What a fantastic coloring job you did on this card. I can absolutely see this as a framed piece of art in your decor. The card you created is just fantastic. 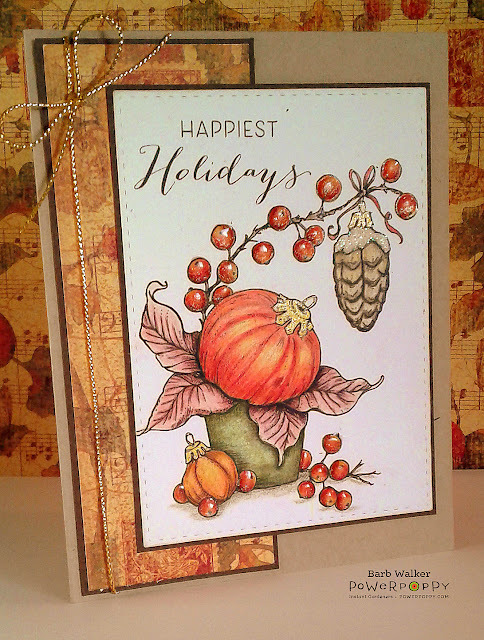 Love the coloring and blending and then with the details you added, it just makes the image sing! Thank you so much for sharing! Hugs! Your blending and shading are divine. This is gorgeous.